The Twitter bird was created from three sets of overlapping circles, suggesting the way interests, events and people interact on Twitter. Our logo is always either blue or white. The Twitter bird is never shown in black or other colors. When using the bird with other logos and graphic elements, maintain a safety space that equals 200% the size of the square around the bird. The Twitter marks include, but are not limited to, the Twitter name, logo, the term “Tweet” and any word, phrase, image, or other designation that identifies the source or origin of any of Twitter’s products. Do not modify or alter the marks or use them in a confusing way, including suggesting sponsorship or endorsement by Twitter, or in a way that confuses Twitter with another brand. Use our official and unmodified Twitter bird to represent Twitter. Each variant of Twitter gray has a bit of blue in it to enable it to pair with Twitter Blue and our secondary colors. White, #ffffff, and black, #000000, complete the set. Words don’t just hold meaning; they communicate by their very form. 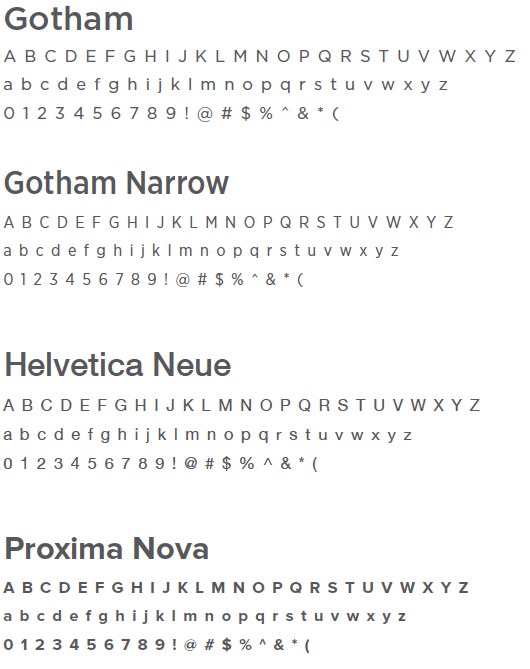 We primarily use the Gotham font family: elegant and direct, stylish but not exclusive. Putting well-designed words in our product enhances the user experience. These guidelines are designed to help you use our brand and assets, including our logo, content and trademarks without having to negotiate legal agreements for each use. To make any use of our marks in a way that is not covered by these guidelines, please contact us at trademarks at twitter.com and include a visual mockup of intended use. For information relating to use of the Vine trademarks or how to display videos from Vine, please see vine.co/logo. Type Follow us on Twitter followed by your @username when you’re unable to show the Twitter bird. Use the Twitter bird to show that your product or device is compatible with Twitter. Show the Twitter bird in front of your #hashtag or @username the same size as the text. See the section regarding Displaying Tweets and other content from Twitter if using Tweets or building a microsite. 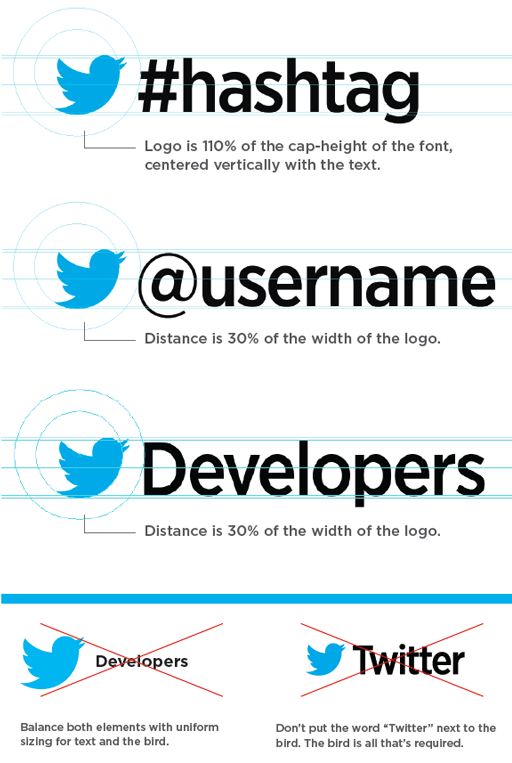 Display the Twitter logo or trademarks larger than your own marks. Use the Twitter or Tweet marks to refer to any service other than Twitter. Use the Twitter bird on your product packaging with your @username to let customers know you’re on Twitter. The Twitter bird should be the same size as your @username and should not be larger than your own branding. Use the Twitter name, the Twitter bird, Tweet, or any other confusingly similar marks on any apparel, product, toy, or any other merchandise. Use Twitter in the name of your website, application or product. Use just “Tweet” or “Tweet” with a simple letter or number combination (for example, 1Tweet, Tweet, Tweets). Register a domain containing “twitter”, misspellings, transliterations or similar variations thereof. Apply for a trademark with a name including “Twitter”, “Tweet”, the Twitter bird, transliterations or similar variations thereof. Use “Tweet” in the name of your application if used with any other service. Make sure the title of your book or publication makes clear that it’s about Twitter, and not created by Twitter. For example, “Learning how to ‘X’ on Twitter” is appropriate, whereas “The Twitter guide to ‘X’” is not. See the section regarding using content from Twitter if displaying Tweets. Use the Twitter bird on your cover or in your title. Use the word Tweet to refer to services other than Twitter. When showing a Tweet online, offline, or in broadcast, do not include actions from other social platforms, as this may confuse users. Any Tweets displayed must be real, from real accounts, and in some cases as listed below, approved by the author. For full broadcast guidelines, please see our resource on our Help Center. Make sure Tweets shown on air include name, @username, and unmodified Tweet text with the Twitter bird nearby. Display the associated Tweet and attribution with images or media. Multiple-image galleries or scenic integrations should be marked clearly as “from Twitter” and provide the associated #hashtag or @username. Show the Twitter bird before #hashtags and @usernames to maximize engagement. The bird should be the same size as the text. Delete, obscure, or alter the identification of the user. You may show Tweets in anonymous form in exceptional cases, as when there are concerns over user privacy. Confuse broadcast with advertisements, which require approval from the Tweet author. Follow our Display Policy for Online Use or use Embedded Tweets. Display the associated Tweet and attribution with images or media. In multiple-image galleries or scenic integrations, Tweets can be displayed via hover or touch interaction. Follow our Developer Rules of the Road and Terms of Service. See our rules on Contests on Twitter and Spam and Automation. See the section on showing the Twitter trademarks. If your microsite is an advertisement and you’re curating content, make sure Tweets are real, from real accounts, and approved by the author. Show name, @username, unmodified Tweet text, and the Twitter bird nearby, as well as a timestamp. If displaying Tweets, make sure they are real, from real accounts, and that you have permission from the author when necessary. Display the associated Tweet and attribution with images or media. If showing screenshots, only show your own profile page, the @twitter page, the Twitter ‘About’ page, or a page you have permission from the author to show. See the section on displaying the Twitter trademarks. Do not use the Twitter marks in your avatar or the background of your Twitter page. Capitalize the T in Twitter and Tweet. By using the Twitter marks you agree to follow this policy as well as our Terms of Service and all Twitter rules and policies. Twitter reserves the right to cancel, modify, or change the permission in this policy at any time at its sole discretion. For further information about use of the Twitter name and trademarks, please contact trademarks at twitter.com.